Right and left keyboard arrows to move left and right. Up to jump, down to crouch. You can crouch while walking to avoid wasps for example. Letter X on the keyboard to attack enemies and interact with levers. The hearts at the top of the left corner shows you how many lives you have out of 9. When you get injured, you loose a life. If you loose all, you die and have to restart the level. The timer is only there for bonus points, you won't loose if you don't make it within the time. The better time you have, the better your score is. You collect fish treats and yarn balls which are your points. The more the better. 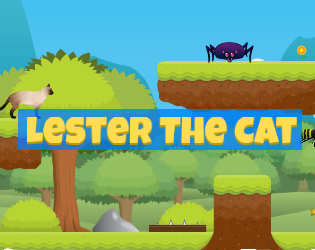 This is a fun, short, 3 level platformer game featuring the cat Lester, who one day was out in his favorite forest, when he discovered, things weren't as always. Someone calling himself Lizardo has taken over the forest and forcing its inhabitants to either side with him, or loose. I, the developer, started on this game a few years ago. It was intended to be a full game with many levels and boss fights, but I couldn't finish it because I had less and less time as unemployed with little money, and crowdfunding didn't work out. The end result is a short, but still fun game that I hope people can enjoy to play for free online. There might be a few bugs here and there, but I think they shouldn't be many or hinder the gameplay too much. If you find any, you are more than welcome to report it back to me and I might see what I can do in my spare time. If you like the game and want to show your appreciation, you can contribute any amount you wish through paypal by clicking the "support game" button right underneath the game. I appreciate all and any amount of contributions, so thank you very much if you do. If you load the first level and there's content missing at the top right corner where the health and points are supposed to show, try refreshing the page to restart the game which usually seem to fix the problem. I'll be trying to see if I can fix it in the meantime. The main theme song was made by me. The background nature sound, and some other sound effects were made by others and used with permission, such as some sound effects from freesound.org with license CC0 (creative commons 0). Most graphics were drawn by me, but there's also a few from places such as Pixabay with CC0 licenses as well. Feel free to make gameplay videos of playing this game and share it down in the comments section below. I'd love to see them! Will be interesting to see to what scores and times people can manage to get as well. If you have any other comments, feedback, questions, or want to show off your scores, feel free to post them in the comments as well! It was fun though I would have loved to see a boss battle with Lizardo, as well as a few more levels ^.^, keep up the great work! Yeah I would have loved to make it, hopefully maybe sometime in the future, I can.